OK friends, this is the easiest recipe to make and SOOOOO delicious! It took me less than 10 minutes to mix it all together and then 15 minutes to bake! HELLO bagels on Sundays again for this mom! To say I'm BEYOND excited about that fact is an understatement and WHAT took me so long to make these? Because Mmmmmmm!!!!! 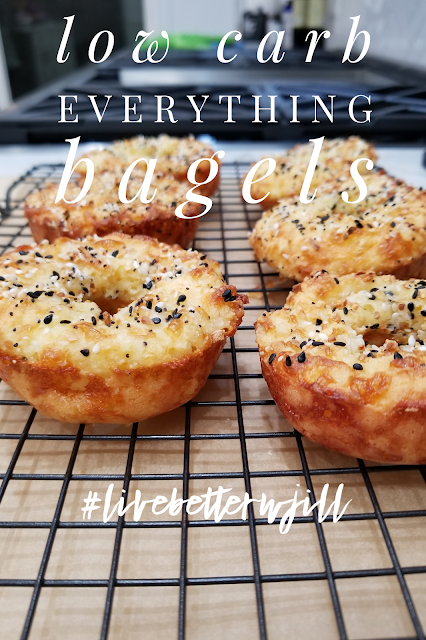 I can't wait for all of you to tag me with your favorite way to enjoy these sinfully delicious and easy bagels! This recipe could be used to create any bagel you love cinnamon raisin, poppy seed, blueberry, etc - simply by adding in a few ingredients as you go! Get creative and tell us your favorite recipe in the comments! If you have a tree nut allergy and cannot cook with almond flour, then you are in luck because I'm sharing how to make them with coconut flour too!. When you are baking with coconut flour, remember this easy ratio to transform all of your favorite recipes into tree nut free too!! NOTE: For every 1 cup of almond flour (or GF baking flour) sub 4 TBS coconut flour and add 1 extra egg. 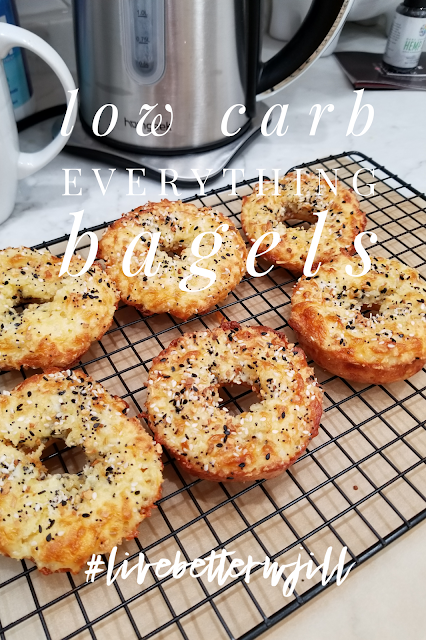 Its that easy!The coconut flour is slightly different in the overall traditional bagel taste but the texture came out pretty darn close! It has a cheesier texture which we LOVED (like it pulls apart more when heated) and hello without all the carbs! Which means ZERO guilt here when I want more than one this weekend! Portion and place batter in tins and pat down to form. *If you don’t have a bagel tin, form them yourself by hand on parchment paper or make into rounds.Bake for 12-15 min till tops are golden brown! Store in airtight container in fridge for up to a week! Perfect in the toaster the next day as well!! Top with grass-fed butter, organic cream cheese, avocado or hummus. Enjoy with eggs, bacon, lox, chicken or tuna salad, and the list goes on for low-carb ideas! As you can see they are the perfect size to enjoy with ZERO guilt! My little helper was right by my side, especially when they were fresh out of the oven. She couldn't wait to try it with her dad, they both wanted lots of butter! I think this next photo says it all! OH MY DELICIOUS!!!!!!! I am VERY excited to share how I RESTORE. NOURISH. OPTIMIZE my health and life! I'm sharing all the tools our family uses on a daily basis on - Jill Samter | YOU. ONLY BETTER. Over 4,000 families are all experiencing amazing results too! Have you read about our favorite GENETICALLY DESIGNED NUTRITION? If you make any of my recipes tag me on Instagram @jillsamter - #jillcooksketo and I'll pick a few to show my followers! Be sure to check out our famous KETO BREAD recipe - its perfect for sandwiches, french toast, grilled cheese, etc. Want to enjoy our favorite French Toast using the sweet bread recipe? Go HERE! Please be sure you review Affiliate Disclosure to understand compensation for sharing above links!